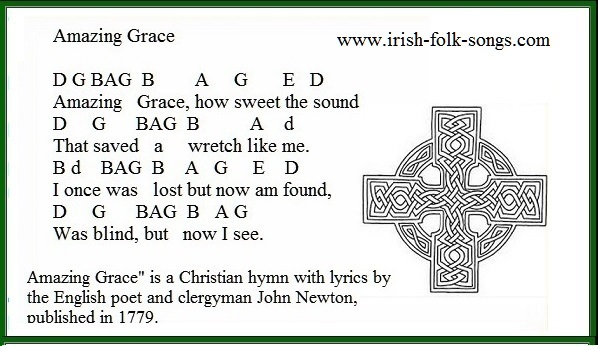 Amazing Grace sheet music and tin whistle notes for traditional folk song. I have included the letter notes for beginners. This is a very easy song to learn how to play. Just follow the notes in the video that I play. This song was a major hit for ​André Rieu and band. 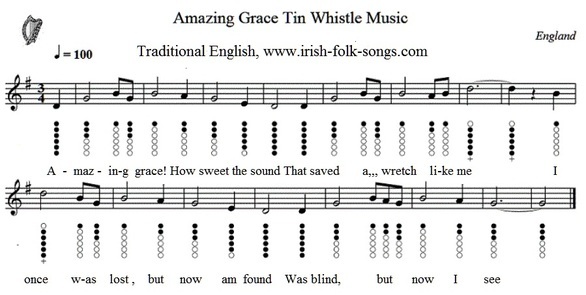 Amazing Grace is just one of over 100 songs that are in the Tin Whistle Song Book. Each with easy to follow letter notes like below. Above are the easy to follow letter notes on how to play Amazing Grace. This is one of the formats I use in my book, plus the sheet music. In the letter notes version above the notes in CAPITAL letters are the low notes up to the B, and the notes higher than B are in small lower case letters. This version is suitable for playing on the recorder or flute also.